One of the natural phenomenons that make me amazed is the rainbow. After the heavy rain this noon, I saw the rainbow and it gave me an idea to write something. Rainbow is a blend of colors that occur due to dispersion of light when the sun penetrates rain droplets in the air, thus making the light breaks down into the colors of the spectrum. I am thinking what if it’s a blend of rainbow colors separated each other. I do believe that the beauty of the rainbow will be much reduced. The series of color looks so beautiful when it appeared simultaneously in a unity. My mind drifted away to the Christian living and the church. There are many church denominations in this world, each of which has different ordinances that may influenced by their culture, they may have different doctrines, teaching methods, or they may have different vision and mission. I analogize the denominations as the colors in the rainbow and thinking how beautiful if those Christians who have different denomination could be united. I am reminded of the Jesus’ prayer in Gethsemane a few moments before he was arrested. I imagine how beautiful if the diversity of church denominations with their difference could be united. United not only in the form of a specific organization or community, but rather the spiritual unity which is based on life in Christ, to know and experience the Father’s love and the fellowship of Christ. Accept, believe and obedience to the truth of the God’s word (John 17:6-8) parting with the Worldliness (John 17:14-16); sanctification in truth (John 17:17-19), desire to bring salvation to the lost (John 17:21-23). In His prayer, Jesus wants us to be united, just as the Father is in Jesus and Jesus in the Father, so are we the believers are in this unity with very obvious purpose. He wants the world knows and believe that Father in Heaven sent Him to redeem the sinner through the death on the Cross, and also the world knows that God loves the world as God loves Him. The problem is how the world can believe in Christ and accept Him as the only Savior who redeemed the sinner if we are the believers instead become a stumbling block to the unbeliever with our behavior which still suspicious of each other, judging, look down on one and another and assume that we are the truest than the other. The God’s truth will be seen from how we live our life, and by our attitudes and reaction in life. If we set a good example, then people will be able to see the truth of the God’s Kingdom. Furthermore, there is no assumption that is the truest, the most important and the best. We are the one body, as Paul said in Corinthians, Just as a body, though one, has many parts, but all its many parts form one body, so it is with Christ. (1Corinthians 12:12) and resumed again in the following verses, The eye cannot say to the hand, “I don’t need you!” And the head cannot say to the feet, “I don’t need you!” On the contrary, those parts of the body that seem to be weaker are indispensable (1 Corinthians 12:21-22) each of us as a part of the body of Christ has a gift respectively, which if combined would be able to be a tremendous power to show the greatness, the glory and the love of God. We should be more intact in the sameness, do not instead enlarge the discrepancy. Rainbow is a sign of God’s covenant with us. (Genesis 9:13) Rainbow is God’s promise that there will be no more floodwater. (Genesis 9:15). In other words, the rainbow is a sign that there is salvation offered by God to the mankind. How beautiful if we are all united like a beautiful rainbow which has different colors but come together to form beautiful strands in the sky and together we proclaim God’s salvation to those who have not been saved so that they will know and believe that there is a joy, peace, love and beautiful life in God. Let’s unite together, hand in hand appreciating each other, accept each difference, support each other, encourage each other, and help each other regardless of denominational backgrounds where we grow. So the world will see a beautiful rainbow of God who always spreading God’s love to everyone. 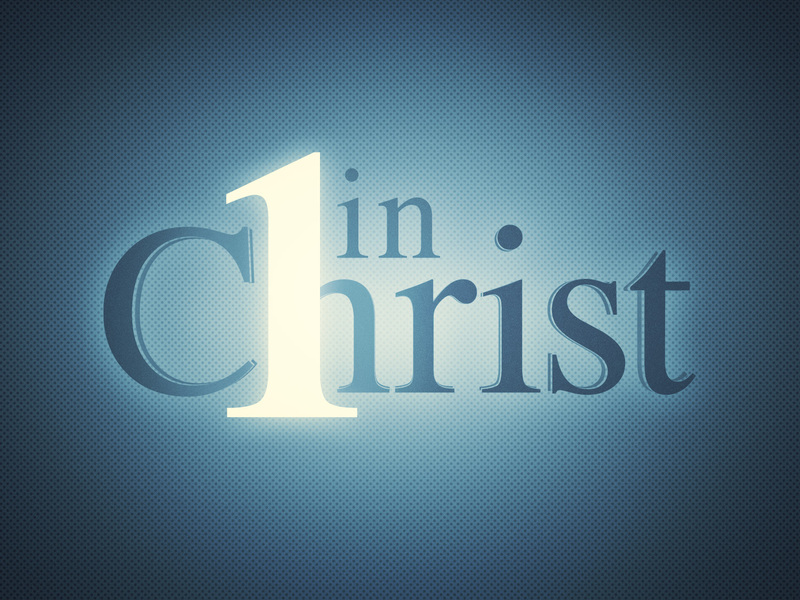 Let us be one, as Christ is in of God, of God in Christ, where we are therein. Are we willing? We are apart by thousand miles of distance; we are apart by tunnel of time. We are apart by seasons. We are apart by culture diversity. We break barriers that divide us along lines of caste, class, gender, race, nation, denomination and age. We yearn to be united and feel connected by an unbreakable bond, to find a true home. We walk and work together with all those who proclaim the values of Christ. We are one in knowing that we must do, and not only think. We are one in generosity. We have many ways of giving. We are one, called to tell others about the gospel. We sing Him. We pray Him. Live, seek, and think Him. We lift on high the name: Christ Jesus. We testify of Christ Jesus. We have faith in him. He makes us one. Thank you very much to Sister in Christ Nancy for the additional Bible verses. Karina, these are words of beauty and wisdom. It is heartbreaking to see churches focusing on what makes us different, rather than fixing our eyes on Jesus who unites us by His blood. I am sure it must break God’s heart as well. I hope your message reaches many hearts and begins to bring God’s people together. Amen. I hope so 🙂 Thank you for taking time to read and commenting my post. Have a blessed day to you, sis. Karina. Yes. And said so touchingly, so lovingly. Thank you so much for lovely comment 🙂 many blessings to you. This post is so vital for Believers, so crucial for the Body of Christ, so necessary for our witness to the world. You have wisely and so beautifully written in the Spirit of God with the heart of Christ! I can’t say enough about this article, but it must be read by all who profess faith in Christ and desire to walk in God’s Will. Katrina, this issue has been on my heart for years and years, dear, and you hit it SPOT ON! I continue to be perplexed by the divisions within the True Church. Goodness, even cults like the Jehovah’s Witnesses seem to have more unity! Though they unite in a Lie, they come together at one “Kingdom Hall”- every hall following the same guidelines, protocol, tenants of faith. And they do NOT even know The Lord!!! And so many other false religions! We even see the unity under evil rulers like Hitler and perverted cult leaders over time. And WE WHO ARE THE BODY OF CHRIST are divided?! This cannot be, Sister!! We are reflecting the One True God to the world by how we treat EACH OTHER IN THE BODY! You can tell I am passionate about this subject- it upsets me that we are not the rainbow you describe so eloquently, rather separate colors trying to reflect the relational nature of God without being connected! This is not possible! I join with you, loving Sister, in prayer that we take our eyes off the things that are seen and temporary- in differences between us, and move them decidedly onto that which is unseen and eternal- our Wonderful God and Savior! We cannot be one without walking in the Spirit and in Truth! God bless you for your encouragement to the Body! First of all,to be honest, when I wrote this article today, I am a bit afraid and doubt, just because as you said. this was a vital and crucial topic. I was talking about difference which is for some denomination could be something very sensitive. during wrote this I always pray that God lead and guide me so that every single word I wrote carefully and wisely. about your comment, Yes! it was so true. In the country where I live,there are many false religions more unified. And it makes me thinking, how sadly we are the true Body of Christ so difficult to be united. Thank you so much for your encouraging comment,sis. It mean a lot for me 🙂 Have a wonderful and blessed Monday. Hi Karina! Great most! This is a very important issue in the Body of Christ for obvious reasons, most especially because the devil loves to divide us so that he can render us powerless and vulnerable to his evil devices. When divided we are weak but united we are stronger and can do so much more. Yes! You were so true. The devil will not stoo trying to divide with many ways. That’s why we have to be united into one Body of Christ 🙂 Thank you for the lovely comment, sis. Many love and blessings to you. Dear Karina, what a wonderful post. If only Christ body could be one in unity. We will one day, we know. Such a beautiful poem you wrote to Sue. You are a blessing. Lord bless you!! Thank you so much for the encouraging comment 🙂 let’s pray for the body unity 🙂 Have a wonderful evening to you. Great post, and the point you made is a vital one indeed. That has been a personal gripe of my own, and I don’t think I could have worded it as well as you did. Keep it up and be blessed! Thank you for taking time reading my post and also for your lovely comment 🙂 it all was such an honor for me. Blessings to you. Karina, this is lovely! This is such a needed message for the church today. We are so divided over things of little consequence, and in so doing, we make Christ seem unappealing to the unbelieving world. It’s horrible! Beautiful message, sister, and wonderful poem. Blessings to you! Thank you very much for reading and for your great comment. Let we always pray for the unity among the difference. So the world can see the unity Body of Christ. Amen. Thank you and many blessings to you, sis. Karina, you have encouraged me in ways only God knows by this beautiful poem and post. You are such an encourager, not just to me, but to so many. Blessings and hugs to you!!! I miss you and all my other blogging friends. Just still not sure when I can return to blogging, but hopefully soon. Love you all! What a suprise!! I I really didn’t have idea you visited and read my blog posts 😉 you know what, sis…we all are miss you so much and hope ASAP can read your awesome posts. Sis, personally I keep pray for you and your situation there. Still be courage and trust that God always be with and help you get through all of this. Thank you sis:) many love and blessings to you. Thanks Karina! Much love and hugs! Thank you so much for taking time reading my post. Well, I got something valuable from your story. Yes the problem is not the church with its denominations, but is on ourselves how we treat us as a Body of Christ. Kriz, once again thank you so much for your great story. It mean so much for me 🙂 have a blessed evening to you. I loved your analogy of the rainbow. What a powerful analogy…..Together we are strong…..
Seperately we can only do so much but together we can make an impact in this world! There is no perfect church. Every denomination has a function, calling, and mandate. Catholics, methodists, pentecostals….and so on! But we are still part of one body! Your have addressed something so key Karina. We need a lot more understanding in the body! We need to break the walls we have created within ourselves….Where there is unity there is a blessing! Thank you for sharing this Karina! You are welcome 🙂 Thank you so much for reading my blog post and for the lovely comment. Let’s break the wall of difference by to be united. Amen. Many love and blessings to you. Yes it is sad that there is so much division in the body of Christ. I had someone judge me recently because of the church I go to. They said their church was better and that I should go there instead. Church is not a competition, we should love each other and be united in Christ. Yes. It was sad. I really love your statement “Church is not a competition” Church is not about which is the best. Thank you so much for reading and commenting my post,sis. Have a great and blessed day. Hope you and your family are happy and blessed! Thank you very much for your kind comment 🙂 have a blessed evening, Grandpa. Beautiful, heart-warming post and poem. It truly is sad when churches separate themselves from others, even from those who agree on the essentials, but disagree on things like music and clothes. It must grieve the heart of God. Thank you so much for taking time to visiting and reading my blog post also following my blog. It was such an honor for me. Thank you for you lovely comment 🙂 Many love and blessings to you. I’m sure that when Christ looks upon us and our multiple denominations of Christianity, He must wonder what we humans have done to His original teachings. However, because we are human and believing in these teachings is a true act of faith– it’s more important that we at least try to “love thy neighbor as thyself.” The denomination won’t matter. Peace. I see God allowing the denominations because of what we as humans have come to… putting our desires of God’s. But not what He intended. Oh how I agree that we should all be going after what He desires together as one Church. How you Karina. Being missing you guys. Have been a little busy with ministry and other stuff. Thanks for your support and holding forth the torch. Lots of love to you my sister. I am doing fine here. Thank you for asking me and thank you for visiting and liking my post 🙂 May your ministry to be blessing to many. Jesus bless you and your ministry. Yes I agree Karina, we are to be one in our focus as we see in the Scriptures you shared ….by being like-minded, having the same Love, being one in spirit and of one mind….. but this does not mean we agree to disagree either, we must always stand firm in God’s Truth so we do as He tells us, we seek to resolve our differences with His Truth (see below) and there is only one Truth. The Holy Spirit does not say one thing to one person and something to different to someone else when it contradicts although He may share something with you that you can share with me or me with you. But we are not to argue about man’s own fleshy understanding or as the Scriptures call it debate, which has a different meaning in the Greek than how it is known today, if they don’t accept the Scriptures we move on. What I have found is that some share only partial Truth, mixed in with their own thoughts, feelings and ideas or what other people have said that is also in error and so when Scripture confirms they are in error, they reject the Scriptures or ignore them. Jesus tells us how we can know what is His Truth and know what is deception and it is not just about written words but The Spirit in them, but we can’t know His Truth if we don’t do as He tells us, which is to Ask, Seek and Knock and then as we are empowered by The Holy Spirit, Trusting in God’s wisdom He leads us into all Truth. What we share with others must be about God’s Truth not what we think is True, because if it is in error, we are than doing what this Scripture tells us not to do….Do nothing out of selfish ambition or vain conceit. Rather, in humility value others above yourselves…. Yes we are to put others first, to be willing to wash their feet regardless of the cost to us personally, to help all those in need regardless of who they are. Jesus tells us also we will be hated, ignored or rejected when we do as He did, by those who have no understanding, meaning they are fleshy, Natural and worldly, they don’t have The Holy Spirit (1Corinthians2:9-16) Jesus was hated when He shined His Light, meaning He shared His Truth, Hate is the absence of Love. God’s True Church is not in a Building made of bricks or anyone Denomination or a House Church, it is in our Heart and the walls are made of Love, genuine Love not Saccharin sweet love, that says and does what is expected and wanted even though they are in error. Karina this is a beautiful post and so true. the divisions are one of the things that I used to see as a non Christian, It was very confusing to me and when I first was saved I chose the church I go to because they do not place emphasis the denomination. I love how you used the rainbow to show how beautiful all of us together would be… One day in heaven we shall see that beauty in person because all of us will be there together united as God intended us to be. Thank you very much 🙂 Blessings to you. Wow, this is a really well written post! I just love rainbows too. They practically stop me in my tracks whenever I see one, no matter how faint it can be in the sky. It always makes me think immediately that the Lord Himself had me in mind to make it there displayed for me to see at that very moment. I love your analogy about how different Christians can be like the different strands of colors brought together into a rainbow. I agree with you that church denominations can be quite a barrier-causer. Not only between Protestants, but also between Protestants and Catholics (which is even more fierce, I understand). Thanks for writing this post, which covers so many points and thoughts that are important. What a wonderful poem too! Beautiful post Sis. I love the way you look see the rainbow representing the unity of the church. I love the poem too. Blessings to you, and continue to write. Thank you very much for your encouraging comment 🙂 Blessings and have a great weekend. Karina, the love of Christ shines through your words. It’s our love for one another that will draw others to Himself and certainly not any bickering or division between His children. God is love. So beautiful Karina. I love your way with words ❤ All we need to do is the loving, its his work to take care of all the rest! Thank you so much for taking time to reading and for the lovely comment 🙂 much love and blessings to you. My pleasure ❤ and all the same back to you! keep up the great work in christ…without the rich heart wealth is an ugly begger. Thank you very much for reading and commenting my post 🙂 Blessings in Christ. your welcome,take care and God bless. Thank you very much for the lovely comment 🙂 Blessings to you. Thank you, brother 🙂 just hope and pray God use my post to be useful for our spiritual growth. Amen. Have a great day. He will use what comes from His word through our hearts. And you have such a warm and loving heart!!!!!!!!! Amen!! Thank you. God bless. I pray for unity among Christians, but I realize why we have divisions after reading this book. It also explains why we need to come to the one and only church mentioned in Acts 2 of the bible. It will be a life changing book if you read it with an open, logical mind. Have a Merry Christmas, my dear, and a Happy New Year! Thank you very much for your reminder to buy the book that recommended by you. I’ve bought that book. But I am sorry both I and my husband still busy and don’t have a good time to read it..this week Iwill fly to 3 countries..Indonesia for two days, Singapore for 3 days, and the I will go to Hong Kong to spend our New Year with our families. Well, I will read a soon as I have good and right time, brother. Once again thank you very much for you attention. Marry Christmas and Happy New Year to you too. God bless. I’m so glad to hear from you as always, Karin. I am also happy to hear you have already bought the book! It will challenge all that you may believe about denominational churches. You are always welcome for my attention as you are one of the most genuine and sincere people I know on this blog! This subjects always saddens me. Christians seem bent on finding the “defects” in their brothers and sisters. Yet, Christ, Himself, prayed, “…that all of them may be one, as You, Father, are in Me, and I am in You. May they also be in Us, so that the world may believe that You sent Me” (John 17: 21). Yes what you said was true. sis. Once they found defects others, they will start to blaspheme as if they are the most righteous and holy men. Thank you very much for the Bible verse, sis. Have a great new week and God Bless.